The Expo will take place in the Las Vegas Convention Center from 30 January – 1 February 2017. It is co-sponsored by the American Society of Heating, Refrigerating and Air-Conditioning Engineers (ASHRAE) and the Air-Conditioning, Heating, and Refrigeration Institute (AHRI), and is held alongside ASHRAE’s Winter Conference. The Expo provides a forum for the worldwide HVACR community and in 2017, exhibitors representing hundreds of product categories will participate. This includes those focused in the three key areas of building automation and control, software and indoor air quality. On the Show Floor at the 2016 AHR Expo. The Building Automation and Control Showcase area highlights products and services for building automation, energy and facility management systems, climate controls, monitoring systems and wireless and cloud-based options. The Software Center is dedicated to HVACR-related software, both off-the-shelf and customized products for project and field management including estimating, inventory control, GPS tracking, systems design, remote-based and cloud-based software. Finally, the Indoor Air Quality Association Pavilion area is designated for member companies of the Indoor Air Quality Association. Exhibitors will be showing products related to indoor air quality, such as air quality monitors, exhaust fans, environmental testing systems and dehumidifiers. The AHR Expo Innovation Awards is an annual competition that celebrates the most inventive and original products, systems and technologies showcased at each year’s AHR Expo. This year the ceremony will take place between 1.00-2.00pm on 31 January in room N253 of the Convention Center. There will be awards in the categories of: building automation; cooling; green building; heating; indoor air quality; plumbing; refrigeration; software; tools & instruments; and ventilation. 2016 AHR Expo Innovation Awards. In addition, one 2017 AHR Expo Product of the Year award winner, selected from among the 10 category winners, will be announced during the ceremony. All 2017 AHR Expo Innovation Award winners have been selected by a panel of third-party member judges from ASHRAE, who evaluated each entry based on innovative design, creativity, application, value and market impact. Filtration+Separation magazine takes a closer look at a few of this year’s winners and their products. Nortiz America has been named the winner of the Heating category of the 2017 AHR Expo Innovation Awards for its series of Combination (Combi) boilers. Noritz America has long experience of the water heating industry and introduced the first electronically-controlled tankless water heaters in 1981. Its winning product, the CB Combi boiler, is a two-in-one unit which uses condensing technology to provide both domestic hot water and hydronic space heating for whole-house applications. The CB Combi performs at a 95% Annual Fuel Utilization Efficiency (AFUE) which means that 95% of the Btuh input is converted into useable heat, making it a highly energy-efficient appliance. It delivers up to 9.2 gallons per minute of domestic hot water and provides nearly twice as much flow as other models. A flow control valve ensures a consistent temperature for domestic hot water demand, regardless of incoming water temperature. This allows greater domestic hot water flow and more precise temperature stability. Two models are available for different levels of demand and they are the CB180DV, which has a maximum gas input Btuh of 180,000 for hot water and 100,000 Btuh for space heating and the CB199DV which has a maximum gas input Btuh of 199,000 for hot water and 120,000 Btuh for space heating. Noritz America will be at Booth No. C5917 at the AHR Expo. The Innovation Award for cooling will go to Daiken Applied. The company designs and manufactures hi-tech commercial HVAC systems and is committed to sustainable solutions for the industry. The Innovation Award is for its Pathfinder air-cooled screw chiller with variable volume ratio (VVR) compressor technology and high efficiency oil separation. By adjusting the compression ratio to meet the load demands of the building or process, Pathfinder’s performance changes as conditions vary and the compressor technology reduces noise and vibration. Daikin Applied's Pathfinder air-cooled screw chiller with variable volume ratio (VVR). There are optional variable speed DC motors on every condenser fan and the Pathfinder utilizes a new fan that features a one-piece, moulded design and low speed operation for efficiency. Daikin’s new fan design moves large volumes of air at exceptionally low sound levels and is not affected by rust, broken rivets, and other maintenance problems . The advanced composite material has been tested to withstand UV light, heat, and humidity corrosion in some of the most severe climates in the world. Daikin Applied will be at Booth No. C2509 at the AHR Expo. Manufacturer of commercial and industrial humidification and evaporative cooling products, Nortec Humidity, will receive the indoor air quality Innovation Award for its GS Series Condensing System (CS) Humidifier. Nortec’s GS Series of gas-fired steam humidifiers are the first fully-condensing systems on the market. The company has been manufacturing gas-fired humidifiers for almost 20 years and has been working hard on the development of a new gas-fired humidifier which uses more economical natural gas and which also operates under the high-efficiency classification. The result is its GS Series Condensing System (CS) model Humidifier. Also available for the GS Series is a low emissions (NX) model which has been designed to meet emissions requirements for the state of California. Nortec Humidity’s GS Series Condensing System (GS) Humidifier. The company says there are installation savings with the new GS series because of the introduction of a CPVC venting option, which is a good alternative to stainless steel venting. Both the CS and NX models feature reduced exhaust temperatures of 140°F/60°C. Nortec Humidity will be at Booth No. C4706 at the AHR Expo. Other 2017 AHR Expo Innovation Award winners are Danfoss in the refrigeration category with its CTM 9Electrical Controlled Transcritical Multi Ejector (Booth C4506) and Titus in the ventilation category for its Helios Digital Diffuser (Booth C3137). 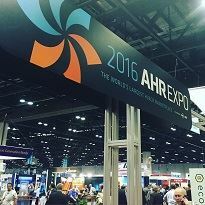 The world’s largest HVACR marketplace, the AHR Expo, will re-visit Chicago in 2018.